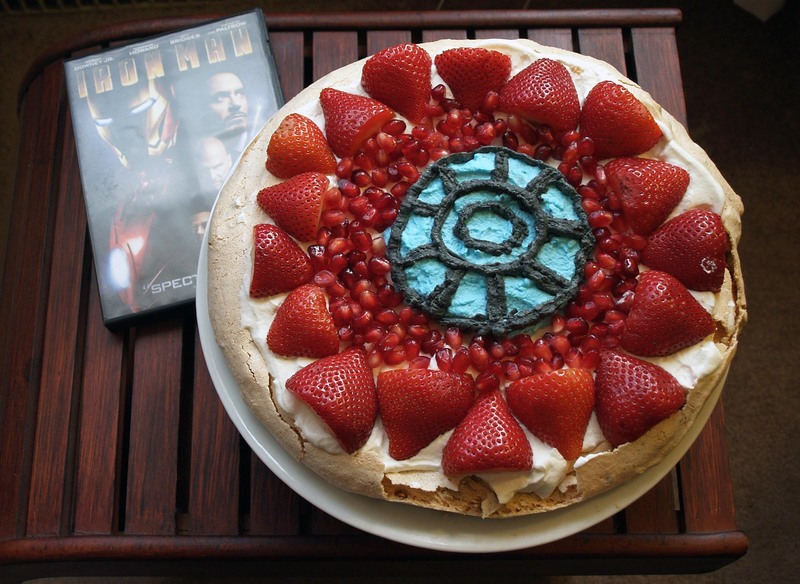 Iron Man’s Arc Reactor Pavlova | I Wanna Bake! My plan is to watch every movie in the Marvel Cinematic Universe (MCU) and invent a companion recipe based on each one. 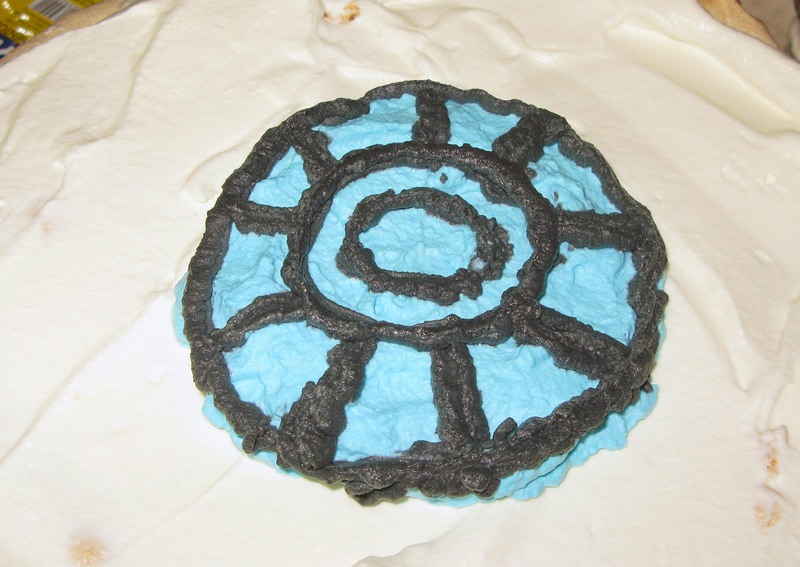 The baking premise of this series is twofold: (1) to represent some core aspect(s) of each movie in a baked good and (2) to take Marvel-themed desserts beyond cakes or cookies decorated like characters (in part because that would get a bit tedious). As an example, let’s talk about this week’s bakeventure, which is based on the MCU’s first release, Iron Man. You can stream the movie for free on Amazon Prime if you’d like to watch and bake along with me. IMDB’s short summary of the movie is as follows: “After being held captive in an Afghan cave, billionaire engineer Tony Stark creates a unique weaponized suit of armor to fight evil.” Part of what the summary leaves out is that Stark is involved in an explosion prior to his capture that leaves shrapnel in his chest that will slowly make its way into his heart and kill him if left unchecked. With the help of a scientist names Yinsen who is also held captive, Stark creates a miniaturized version of a fictional battery (the arc reactor) to insert into his chest, which powers the electromagnet that prevents the shrapnel from entering his heart. This miniaturized arc reactor also eventually powers the iconic Iron Man suit. It took quite a bit of thinking, but I eventually settled on a pavlova for this movie’s companion recipe. Pavlova consists of a meringue base that has a crisp outside and a marshmallowy inside topped with whipped cream and fresh fruit. This particular pavlova has chopped pistachios in the meringue layer to represent the shrapnel in Tony Stark’s chest. 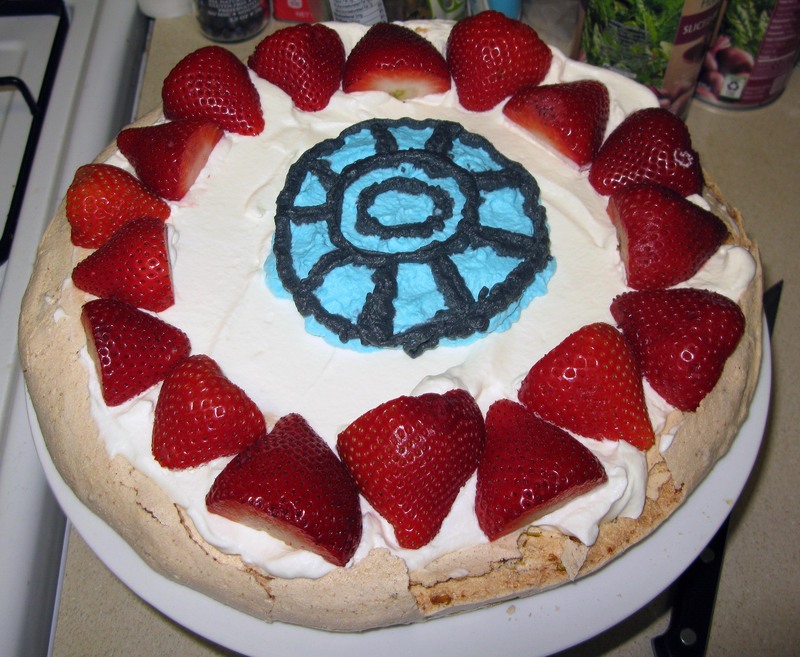 I decided to tint some of my whipped cream blue and black to make the arc reactor in the center of the pavlova, then surround that with red fruit (representative of the red armor, obviously). I used halved strawberries for the outer edge and pomegranate arils (seeds) to fill in the area in between the strawberries and the arc reactor. I think if I made this again, I would probably use all pomegranate seeds, but that is really a personal preference. You can stick with a mix of the two, like I did, or you can use all strawberries or all pomegranate seeds if you prefer. Symbolism and nerdiness aside, this dessert is absolutely delicious. It tastes like summer. I based the recipe on Mary Berry’s strawberry pavlova recipe (found in this cookbook), making the alterations discussed above. The strawberries do taste quite good, but the pomegranate and pistachio flavor combination works exceptionally well. I considered adding some pulverized, dried strawberry powder to the meringue base, but I’m glad I didn’t because that might have been one variable too many. My meringue layer did crack a bit around the edge (see below), but according to the recipe’s description, this is ok. 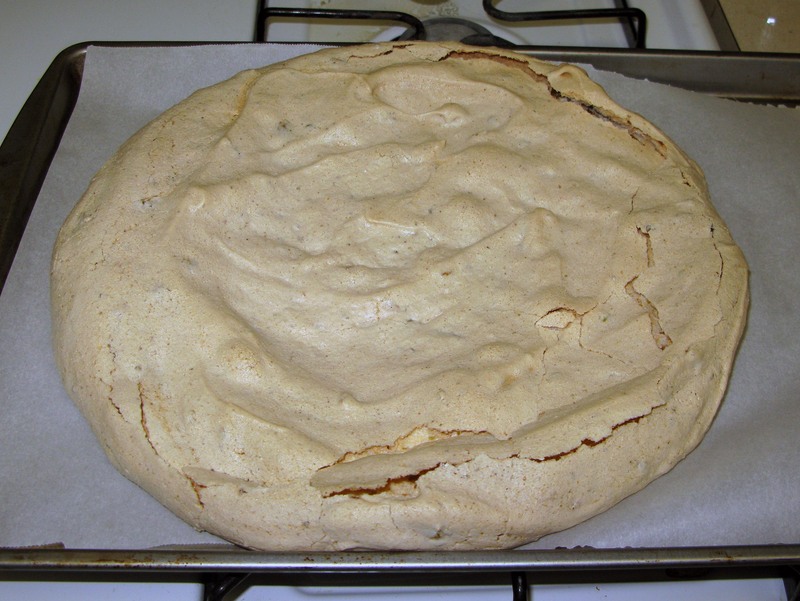 In the future, I might try baking the meringue at a lower temperature to prevent the edges drying out as they did. One critical step that should not be skipped is cooling the meringue in the oven. As far as I know, this is true of most hard meringue recipes. 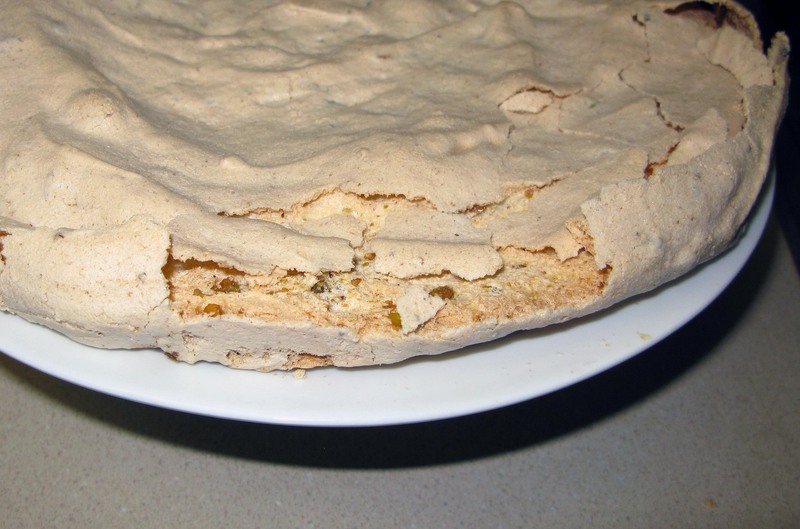 Slow cooling helps prevent cracks in a properly baked meringue. If it’s overbaked, it will crack anyway, but this is one thing you can do to give your meringue the best chance at survival. Because of all the cooling and chilling time, I’d recommend making this over the course of two days if you have the time. 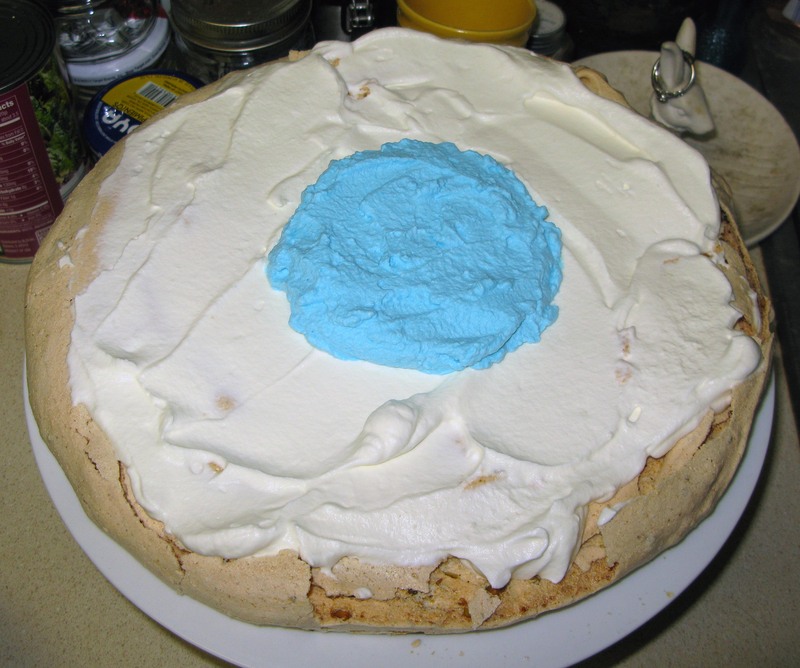 Bake the meringue the night before you want to serve the pavlova and let it cool overnight in the oven. The next day, take it out of the oven, make the whipped cream, decorate, and chill the pavlova for at least an hour before serving to help it all set. I did it all over the course of one day, but if you don’t want to stress about it too much, I’d suggest taking the extra time. Iron Man made a big deal about its AC/DC soundtrack, so I will suggest the classic Back in Black for this bakeventure. 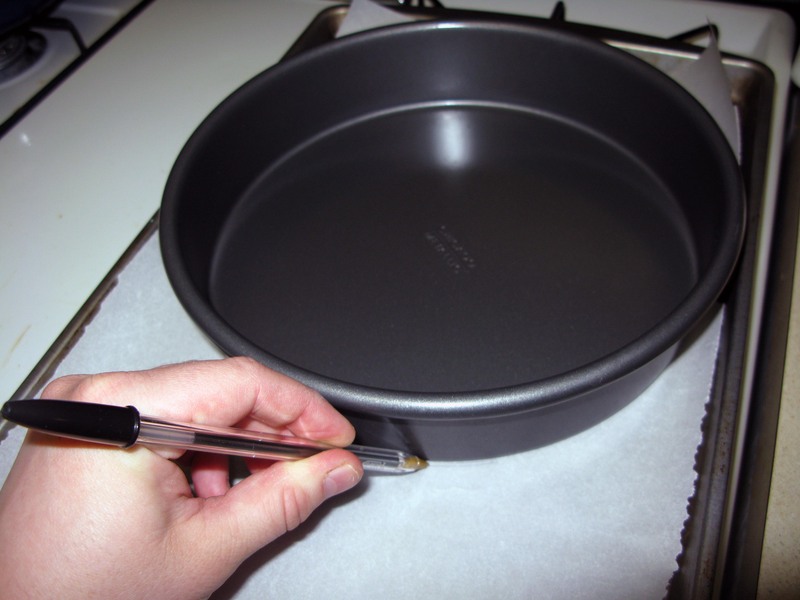 Draw a 9″ diameter circle on a piece of parchment paper. I did this by tracing a 9″ cake pan. 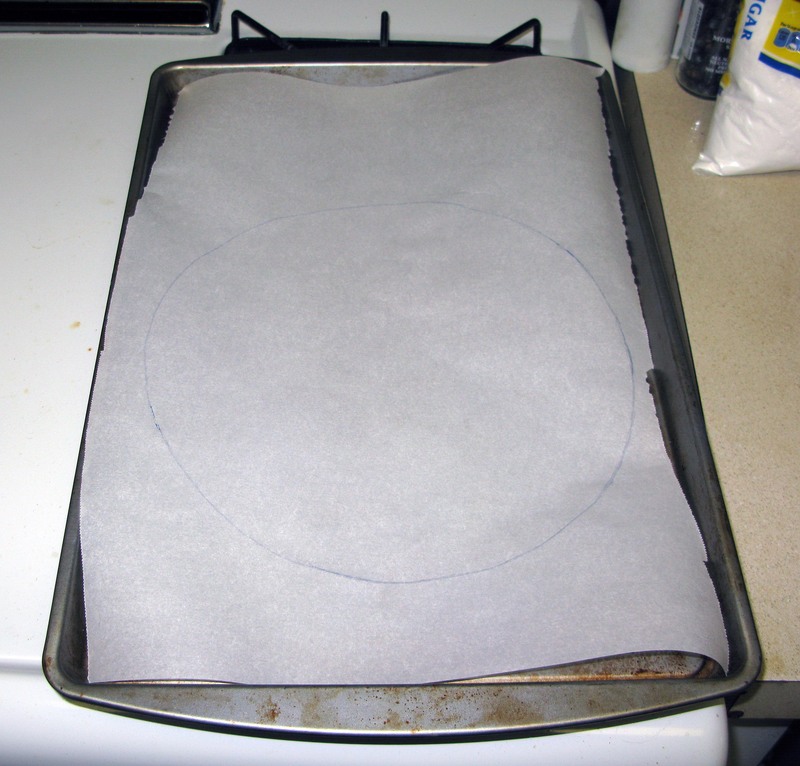 Place the parchment, circle side down, on a cookie sheet and set aside (this prevents the ink from getting into the meringue). You should be able to see the circle through the paper. If you can’t, trace over it with a darker pen or marker. 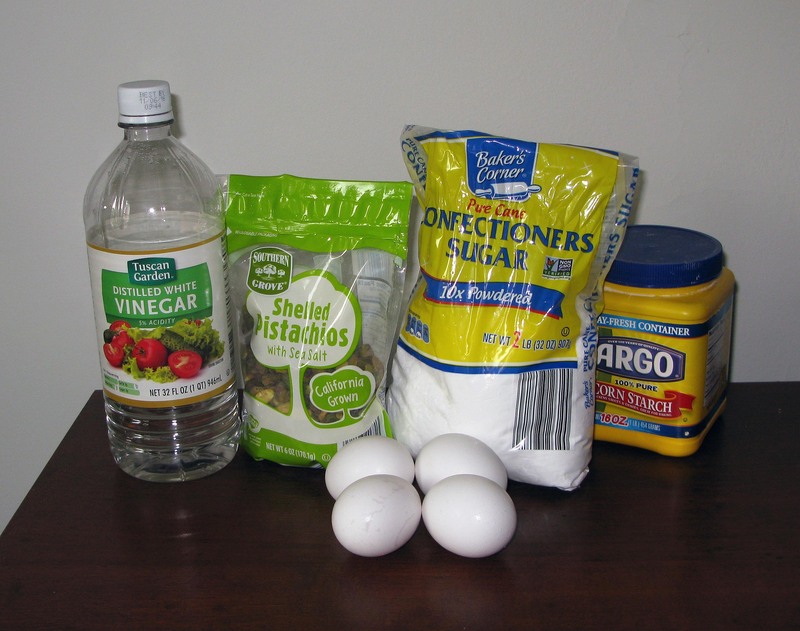 In a small bowl, stir together the cornstarch and vinegar until smooth. Set aside. 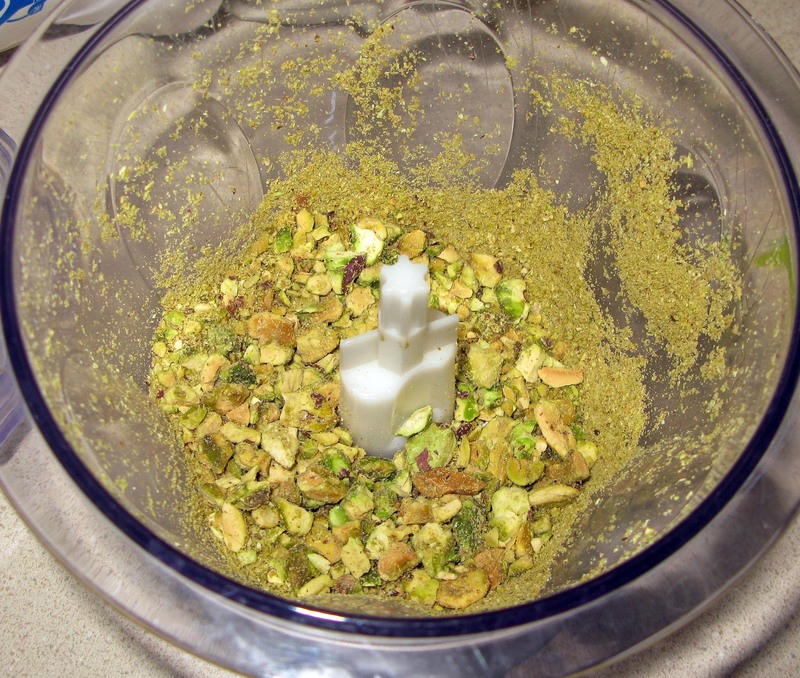 Chop your pistachios into largeish chunks using a food processor or a knife. Set aside. 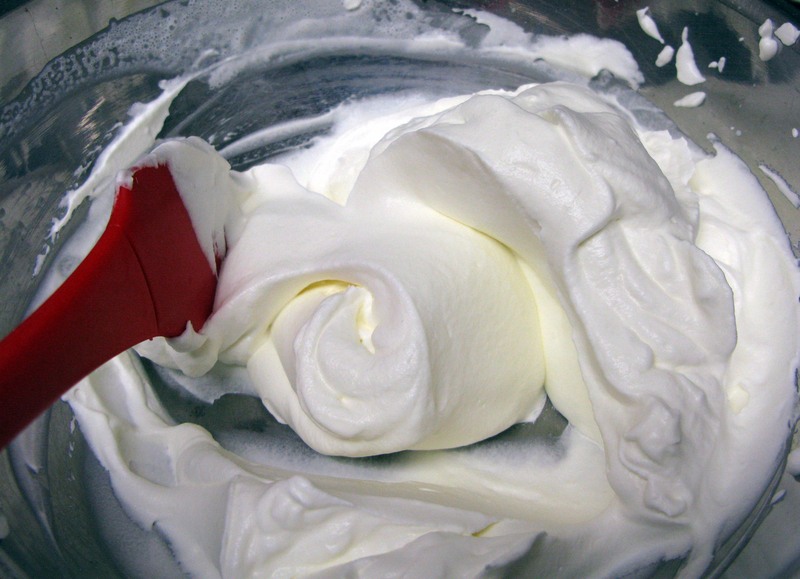 Using a stand mixer with a whisk attachment, whisk the egg whites on medium speed until they hold stiff peaks, about 10 minutes. The original recipe describes the consistency as “cloud-like,” and I’d say that’s pretty accurate. You can do this with a hand-held electric mixer or by hand, but it will take longer (and I pity your forearms if you do it all by hand). While the mixer is running on low speed, add in the powdered sugar 1 teaspoon at a time. Yes, 1 teaspoon. This helps to ensure that all of the sugar is evenly incorporated with no gross lumps. Stop occasionally to scrape the sides and bottom of the bowl when you see sugar building up on the edges like below. When all of the sugar is incorporated, you should have a glossy, thick mixture. 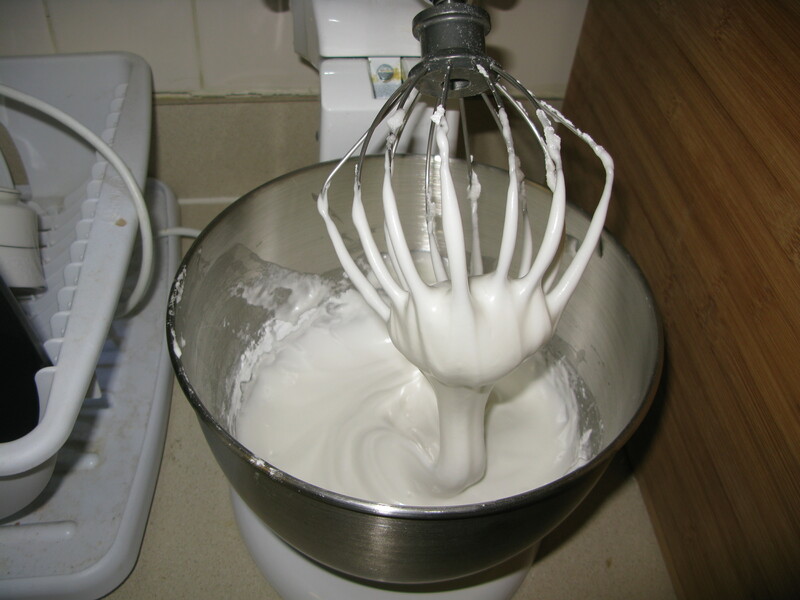 Add the cornstarch and vinegar mixture to the egg white and sugar mixture and whisk on medium speed until it is well-incorporated. At this point, the meringue should have the consistency of marshmallow fluff. GENTLY fold the chopped pistachios into the meringue using a rubber spatula. Scrape the meringue mixture onto the parchment paper and gently spread it into the shape of the circle you drew. Make a slight dip in the center. 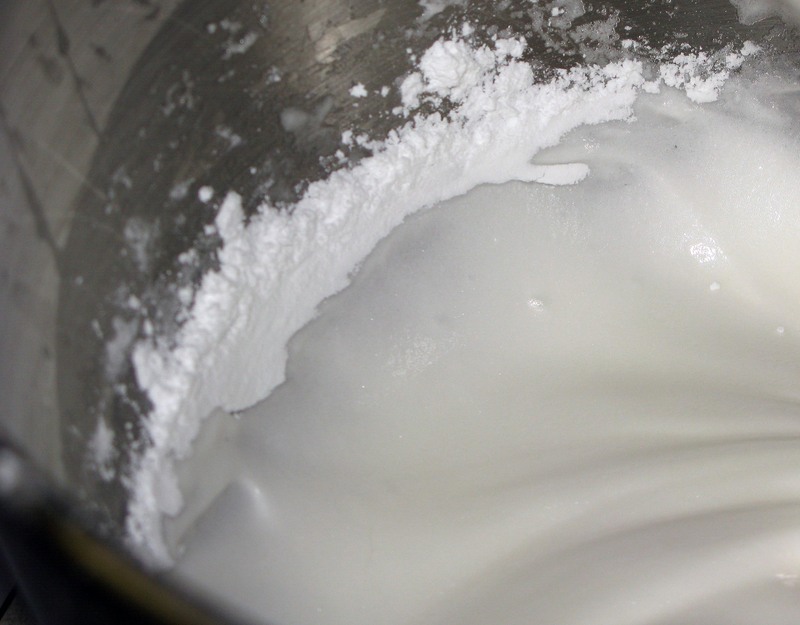 Put the meringue in the oven, then immediately reduce the temperature to 300°F. 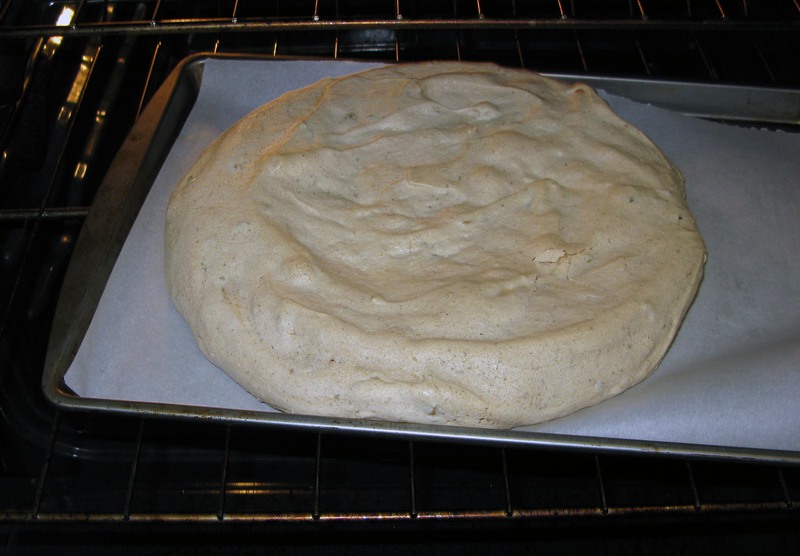 Bake for 50-60 minutes, or until the meringue is firm to the touch and lightly browned. At this point, turn the oven off and leave the meringue inside with the door closed to cool completely (this helps to prevent cracks). You can leave it overnight if you like. When you are sure it’s cool (it should have been at least 4 hours), take it out of the oven. Some cracks on the top are ok because you’re going to cover it in whipped cream and fruit anyway. 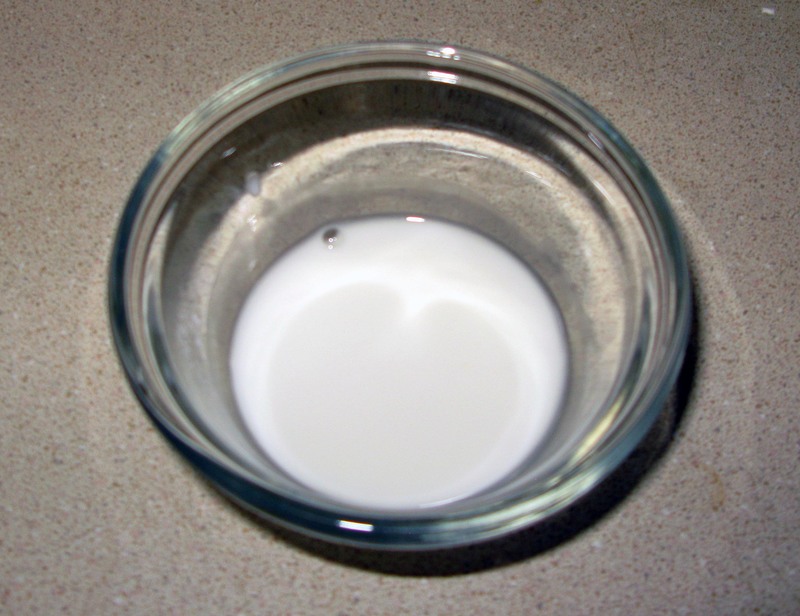 At this time, put the bowl you will be whipping your cream in and your mixer’s beaters in the fridge to chill. Carefully peel the parchment paper off the bottom of the meringue and transfer it to a serving dish. Set aside. 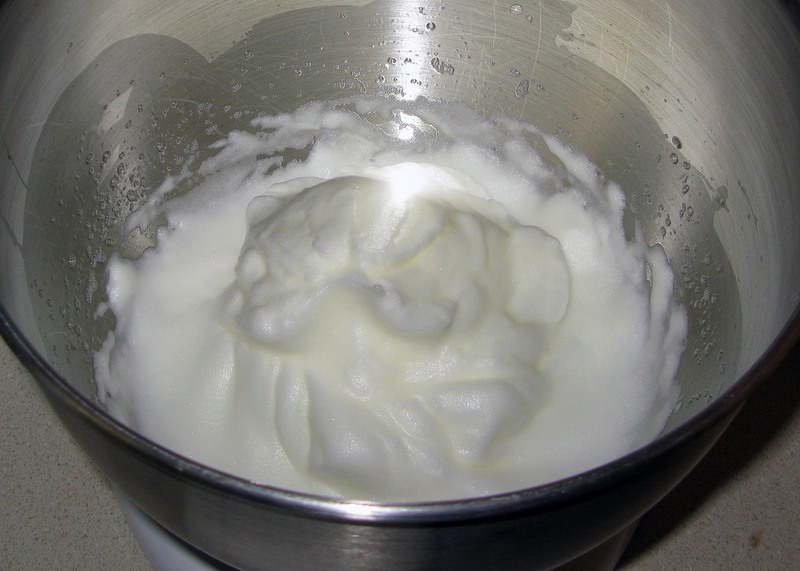 Put the cold cream in the chilled bowl (the one you put in the fridge a little while ago) and beat until it thickens and holds soft peaks. Add in powdered sugar to taste and beat until the whipped cream is nice and thick and holds its shape well. Reserve ½ cup and ¼ cup of the whipped cream in separate bowls. 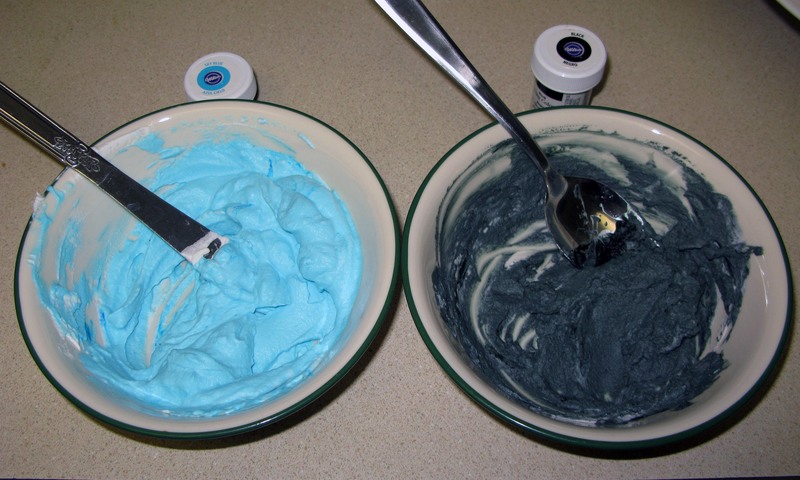 Tint the ½ cup light blue and the ¼ cup black (dark gray is ok, it will darken over time). 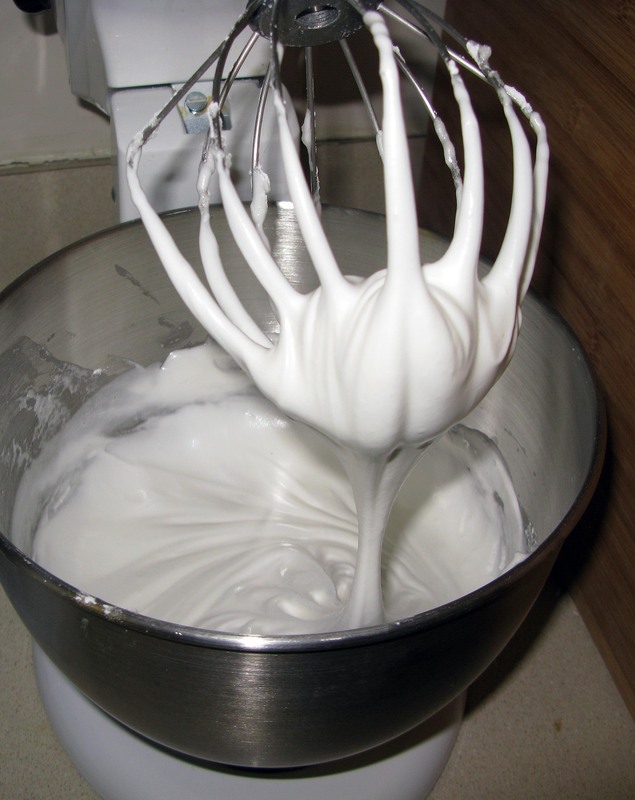 Spread the remaining white whipped cream on top of the meringue, leaving it a little bit thinner in the middle. 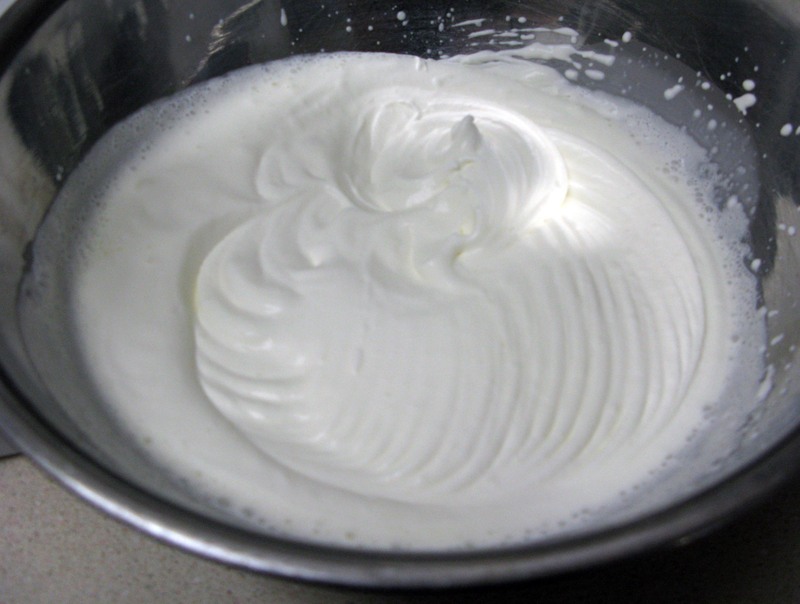 Spread the blue whipped cream in the center of the white whipped cream in a circle 3″ in diameter. This makes up the lighted part of the arc reactor. 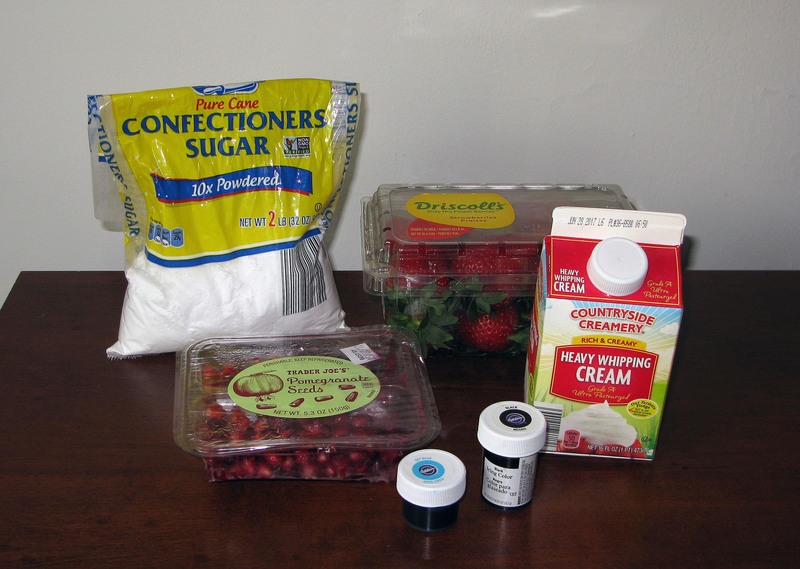 Transfer the black whipped cream to a sandwich bag and snip about ⅛” off one corner. Pipe the details of the arc reactor on top of the blue circle (I used this image as a general guide). As you can see, my piping is a bit wonky because whipped cream can be a little tough to work with. You can use a toothpick to make small corrections to your lines, but don’t worry about it too much because once the pavlova is finished, the overall effect will still be pretty impressive. Arrange the halved strawberries in a circle around the outer edge of the pavlova. I liked the way they looked when I alternated each berry’s direction, but do whatever you like best. Fill in the white space between the strawberries and the arc reactor with pomegranate seeds (or more strawberries if that’s what you’d rather have). Chill the pavlova in the fridge for an hour before serving. Leftovers keep for about 3-5 days in the fridge.